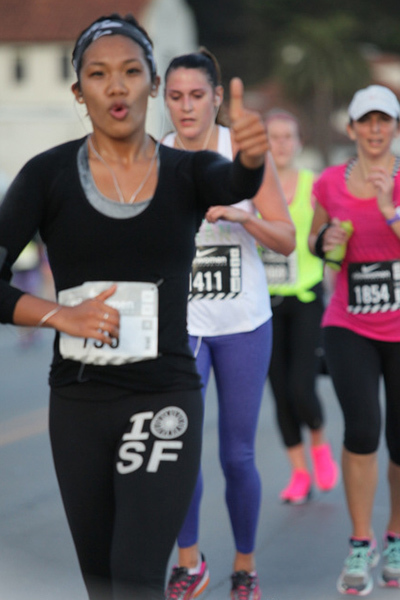 Congrats on finishing the SF Nike Women's Half marathon yesterday! What inspired you to run? 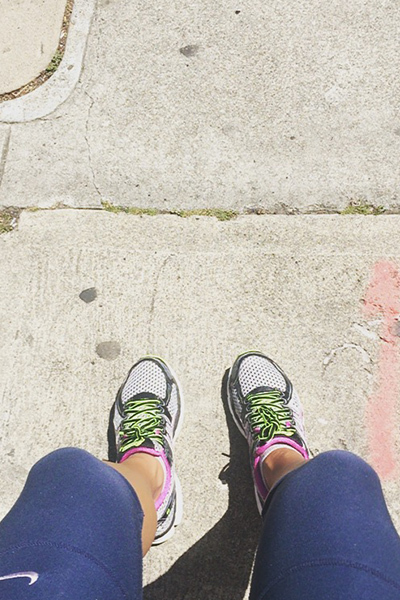 I love challenging myself for things like a half marathon, hikes or even new hobbies. I think that in the back of my mind, I know I can do these things, and I like that thrill or adrenaline rush you get from doing something outside your comfort zone. Also, some of my best girlfriends and I all decided to do it together. Two of them flew in from New York to run. Have you ever done one before? Yes, once before! 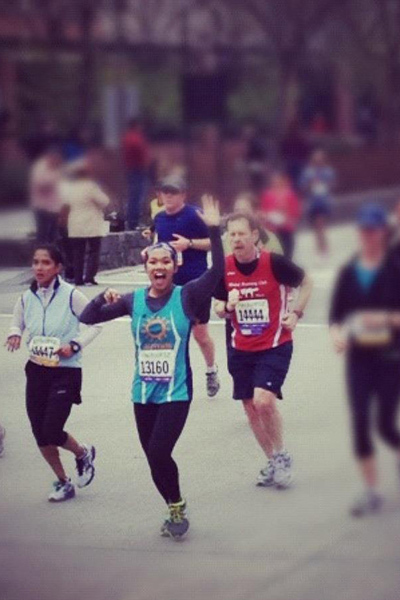 I completed the 2012 NYC Half Marathon (below). How did you train this time? Run, obviously! But I had to be extremely thoughtful about my training schedule, mostly because I teach about 12 to 16 SoulCycle classes per week! That is A LOT of cardio for the body. So what did your routine look like? I planned that for each week of training I would add an additional mile or two. I started by running four miles for the first week or two, then I saw how much I could run in 45 minutes to an hour. On the days I was short on time, I’d drive to an area of San Francisco with the most hills and practice running up and down! Luckily, there are many hills here. Wow, but what about days when you taught three classes? When I had a triple, I would not run. And the days I only had one or two, I’d try to run 30 minutes or a few miles as well as do some strength training. Strength training is super important for runners or anyone looking for an overall change in his or her body. Before the race, the most I’d run distance-wise, was 10 miles. Thanks to SoulCycle, my endurance has always been high. Running each week trained my body for the load. How did your eating and hydrating change? The only changes in my eating habits and hydrating was just an increase! Since SoulCycle and running are cardiovascular exercise, it was important for me to not just hydrate but to also get an efficient amount of electrolytes. I made sure to eat more because I was burning more. What do you like to eat before and after a run? At least 30 minutes before a run, I usually go for a smoothie or a piece of fruit. If I have more time, coffee and avocado toast with eggs is the bomb. Post-run, I also go for a smoothie with protein, greens, coconut water, a banana and almond butter within 30 minutes of my workout. Then I usually have an actual meal such as a quinoa/rice bowl with a piece of chicken or salmon and veggies or a sandwich. 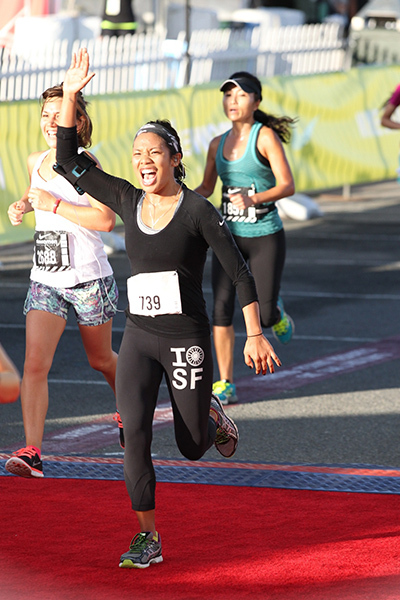 Running 13.1 miles requires a lot of digging deep — and mind over matter. What do you think of when you're trying to push through a tough hill or a cramp? When I was in high school, one sport I played was lacrosse, and we had a new coach one year who not only made us work on technical skills but also made sure we incorporated the field in our everyday lives. As a former wrestling coach, he had some tricks up his sleeve that he claimed were genius. At the time, I am sure none of us thought he was serious. We would have homework assignments that never included our stick skills. Instead we had to write about adversity or do something silly (yet beneficial) like using our non-dominant hand for the day or even learn to juggle. The quote above we were told to memorize and be able to recite... especially during running drills. I remember breaking down each lines and understanding what it meant. This quote basically says “do not quit.” Now, almost a decade later, I still am reciting this in my head, for everything other than running. We are capable of the things we believe in — do not quit. I also always remind myself of my intention. Why am I running? Who am I running for? Me. Me. Me! What's your best advice for staying motivated? * Find a buddy. Whether before or during the marathon or anything you want to achieve, find someone to connect with. It doesn’t even have to be with words, just eye contact or a simple “Get it GIRL,” makes all the difference. * Let go of the expectation. Know that you succeeded the moment you committed yourself to a goal. * Listen to music that you love and that makes you feel good. * Be present. But don’t forget to stop and smell the roses. Take advantage of anything that will keep you in the moment. Before you know it, you would have crossed the finish line. “Keep your head up and heart strong.” — Ben Howard. This lyric is so beautiful and speaks so loudly to me for not only when I run but for many other things going on for me. It is the greatest reminder to trust my truth and the person I am. I cannot and will not be anything less. It reminds me that no matter what, keep going. You HAVE what it takes. 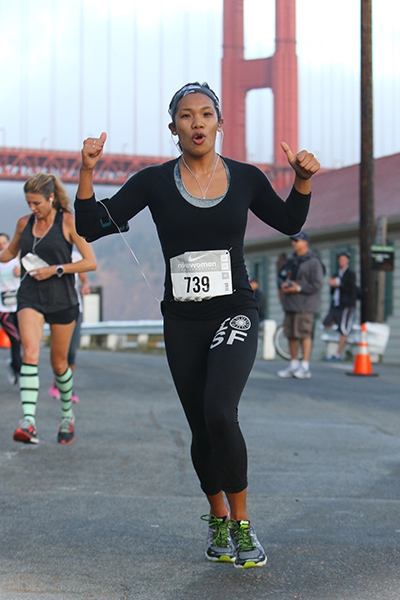 This first time I ran a half marathon in 2012 was because people believed that I was less than I actually was. I felt so broken that these people tried to define me. I was so broken that I believed them. Thankful that I learned more about myself, I vowed to be different and change for the better of me. So I signed up, ran that March, and then a few months later I was accepted into the SoulCycle training program. I knew if I could do these things, I could do anything. The gift that SoulCycle has always given me was the realization that I had a choice. I was the only person capable of choosing who I wanted to be. Never let anyone take your CHOICE away from you. If you have to fight for it, then be brave and fight. You deserve nothing less. Catch classes with BEA at SoulCycle at SoulCycle Castro, SoulCycle SoMa and SoulCycle Union Street! Want to ride? Click HERE to grab a series and book a bike! Questions or comments? Email blog@soul-cycle.com!